"The Devil with Eyes behind his Head 狼顾之鬼 (láng gù zhī gǔi)"
The cunning. The scheming. The ultimate bad guy. He is the beginning of the end of the Three Kingdoms era. If you have never read Romance of Three Kingdoms, my apologies for the spoiler. We are talking about a man of ambition so great, it transcended two generations after his death before it was achieved. Portrayed as cunning and untrustworthy with promises, Sima Yi is practically demonized by the story. No doubt he was the most important military advisor the Kingdom of Cao Wei 曹魏 ever had, time would never dilute his usurper legacy that erased Cao Wei off the face of the planet. As tribute to this incredibly smart yet devious historical figure, the card game has aptly given Sima Yi abilities that make him a formidable opponent. 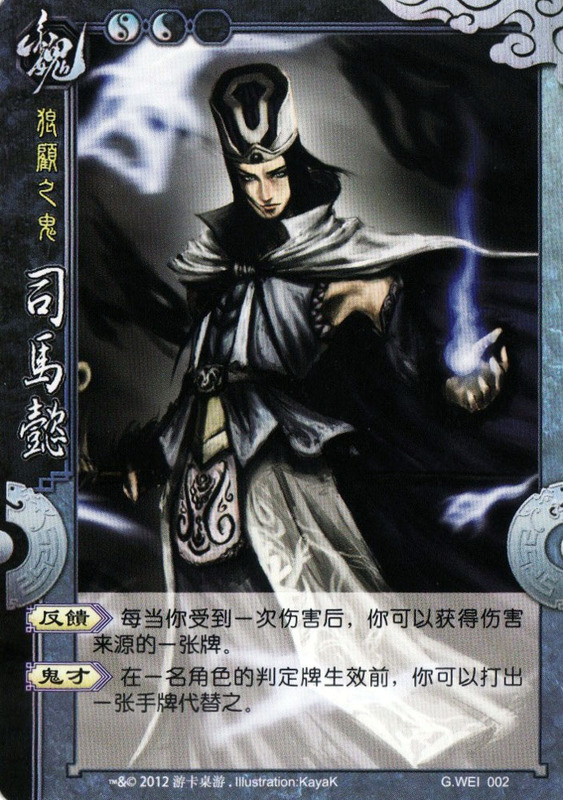 Meet the most dangerous character in the entire San Guo Sha 三国杀 card game. Character ability 1: "Retaliation 反馈 (fǎn kuì)"
Every instance after you suffer damage, you can acquire a card from the source of damage. Before the judgement card of a player takes effect, you can play an on-hand card to replace it. The term “immediately” is removed to clarify the timing of activating “Retaliation”. It is generally well-known that Sima Yi was a smart and shrewd strategist, but no, he was not smart enough to tinker with heaven's will. The abilities themselves do not reflect Sima Yi as well as how these abilities are used during game play. As a "Judgement Tinkerer", Sima Yi can just crouch inactively, waiting for judgement cards to appear before he rears his ugly head. This somewhat resembles the life mission of Sima Yi as he lay in wait for the right moment, then pouncing on opportunity to usurp an entire Cao Wei kingdom for his own. “Retaliation” refers to his Sima Yi’s tactics against Zhuge Liang. He simply defended himself from Zhuge Liang’s troops, took an advantage and struck back. “Demonic Talent” was interesting. In the story, it was said by Zhuge Liang that the Mandate of Heaven (天命) sided with the Sima family. In the fictional Battle of Shangfang Valley, Sima Yi was entrapped by Zhuge Liang’s stratagem, and was about to be killed by fire. Suddenly, there was rain that was not fortold by Zhuge Liang, and the fire was put off. Even though Zhuge Liang could predict the future (“Star Gazing”), he could not alter it, since the Mandate of Heaven sided with Sima Yi (“Demonic Talent”). It should be noted that only Sima Yi and Zhang Jiao 张角 can alter judgement cards flipped directly. It was because Zhang Jiao started the Three Kingdoms Era, while the Sima family ended it, thus coming the two “fate-altering” abilities.